This information has been made public so that everyone can view, discuss, experiment with and learn from the circuits of monotron series and monotribe. KORG decided to do this because many users have expressed interest in what’s going on inside of these products. This was normal a few decades ago, when electronic devices had their circuit diagrams printed on their back cover. We think that this kind of sensibility is important if we want our users to feel like they actually own an instrument, not just a magical black box that somehow creates sounds. Of course, we can&apos;t do this for all of our products and we do have to issue disclaimers regarding safety and warranty coverage, but the monotron and monotribe created such a big stir among synth fans and tinkerers alike, that we felt that disclosing the electronic schematic was the right thing to do. Our decision to make the schematics of monotron and monotribe public is part of our effort to show people how much fun synthesizers are. We feel that by providing the schematics, users can have a better understanding of how these synthesizers work and in turn, get more out of their experience. * Please read the “monotron/monotribe Schematic Download Agreement” before downloading the schematics. 1. 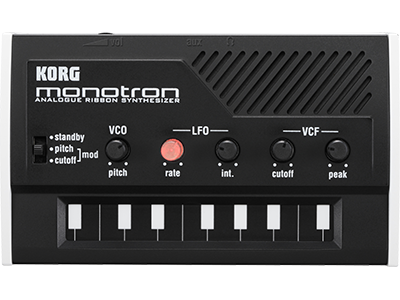 All copyrights to the circuit diagrams for the monotron/monotribe are the property of KORG INC. Copying this content in part or in whole without the permission of the copyright owner is forbidden by copyright law. However, you are permitted to make a single copy for personal non-commercial purposes. 2. You are expressly forbidden to engage in commercial activities such as selling the circuit diagram materials that you have copied in part or in whole. 3. The circuit diagrams are provided for customers who have purchased the product and are using it, and the reader is assumed to be a user of the product. Please be aware that in some cases, KORG INC. and the distributors may be unable to respond to inquiries regarding published circuit diagram materials from people who have not purchased the product. 4. Specifications and electronic circuits of products are subject to change without notice. 5. KORG INC. does not recommend modification of its products. 6. Please be aware that removing screws from a product and opening or modifying it will void the warranty. 7. KORG INC. and the distributors shall bear no liability for any damages (loss of business profits or data, financial loss, or impairment of health) resulting from your use of these circuit diagrams. This limitation of liability shall apply even if KORG INC. and the distributors had been informed beforehand of the possibility of such damages. * Please be aware that this downloading service may be terminated or modified without notice.